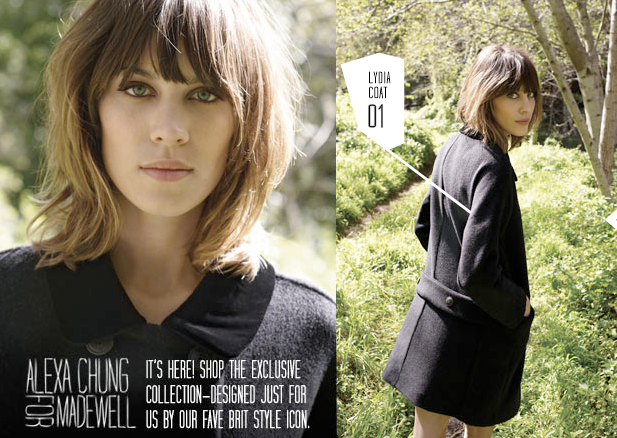 The Well-Appointed Catwalk: Alexa for Madewell - Finally! Alexa for Madewell - Finally! Hype has been building around the Alexa Chung for Madewell collection for what seems like a lifetime, and it's finally here! Well, online. We'll have to wait until Saturday to see the collection in person. These shorts are beyond amazing, and they are by far my favorite piece in the collection. Such a great take on all the wool and leather winter shorts we are seeing this season. These will be mine! 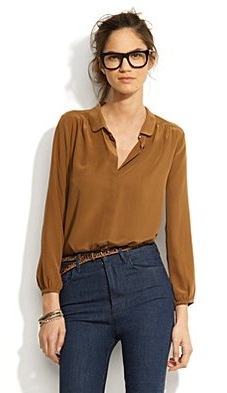 I live in this type of blouse throughout fall and winter. Perfect for overheated office buildings, they look equally good tucked into trousers or skirts as they do hanging out over skinnies. This is what I picture when I think of Alexa Chung. I think I tend to look too precious in this type of dress, but it's adorable on someone like Alexa, no? I admit that this sweater is all about the styling, and Madewell has done a damn fine job here! It would also look good over one of the above blouses (with the collar sticking out, of course), toughened up with some lace-up booties and chunky jewelry. Cause there's nothing like an engineer-striped denim apron! The light and dark denim versions are slightly less offensive, but still... no. So, what do you think? Does the collection live up to the hype? ohhh yeaaah, pumped for this! this looks great-look forward to checking it out..
love the collection and agree with you on that overall... not very nice! she looks gorgeous like always! Most of the pieces are cute, but you're right about the engineer overall thingy. THAT'S the extent of their creativity? Lord. Anyway, I got my AHAVA goodies, doll. THANK YOU! So excited to use the masks. I haven't done one in years. Love that polka dot dress but yeah, on her it looks great. It would be too 'young' looking on me. I love her grungey hair too. How does one get hair to look like that and still look good?? Love the dress! Great picks. i'm in love with the polka dot shirt and tea dress (which also has polka dots). overall i'm a fan of the collection...though i think alexa is pretty cool, so there you have it. check me out at http://pinkpopmash.blogspot.com (marissa's have to stick together ;).